Back in early January, when Emmonak resident Nick Tucker wrote a letter to the Dillingham Bristol Bay Times, nobody could have predicted his action would turn into what is beginning to look like a pivotal event in public awareness of a host of problems in the Yukon-Kuskokwim Delta. His letter resulted in a January 12th article in the Times, carried by other papers in the Alaska Newspapers Group. The next morning Mark Dent from the Anchorage Daily News Newsreader referenced the article on the web. On the afternoon of January 13, Camille Conte at KUDO Radio in Anchorage made Tucker's letter and the issue of poverty and disenfranchisement in largely Alaska Native bush communities a compelling topic on her talk show. On the 13th, Writing Raven, at Alaska Real, who had predicted a crisis in the Yukon-Kuskokwim Delta and other parts of rural Alaska, appealed for assistance. Gryphen, from The Immoral Minority sent out an email to friend in the Alaskans for Truth movement the next morning. Alaskan progressive blogs like PA, the Mudflats, Celtic Diva's Blue Oasis, and the Immoral Minority all had local posts up on the 14th. AK Muckraker from the Mudflats had a post up at HuffPo, another anonymous Alaska blogger had one at DailyKos, PA had a post up at firedoglake, and CC had Nick Tucker and others on her program live on the 14th of January. Within hours these people, with the help of others had raised thousands of dollars for relief in the lower Yukon Delta, and to send Dennis Zaki to Emmonak to meet with residents there, and get first-hand information back to readers and viewers outside that isolated area. The next day, the ADN Newsreader covered the bloggers' response in detail. From that time, coverage widened, becoming national as CNN showed interest in the material generated by Dennis Zaki's struggle to get to the village in the face of winter storms throughout western Alaska. The progressive Alaska bloggers and Alaskans for Truth members who were so pivotal during the period from January 13th through 16th on this were sincerely compelled to provide immediate material assistance. We were also motivated by Alaska Gov. 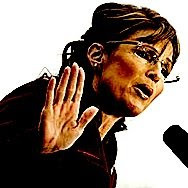 Sarah Palin's comments that had been publicized the week before, about "bored, anonymous, pathetic bloggers who lie..."
It is more than ironic that one of the results of our local bloggers' efforts has been a surge in progressive Alaska Native blogging. 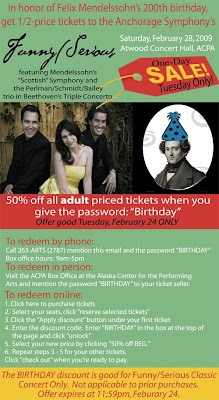 One new blog, featuring Native Alaskans is called Anonymous Bloggers. Its most recent post is Diary of a Proud YUP'IK Mom. Watching attention to the lower Yukon and Kuskokwim area unfold these past 48 days has been a learning experience for hundreds, if not thousands of people. And more attention will be directed to this incredible array of poverty, lifestyle, cultural, religious, ecological and political issues throughout the late winter, spring and into the summer of 2009, because of the efforts of a small group of Alaska progressive bloggers. We went to church because the church picked us up. Our foster mother had little or no money, so a drive to town was out of the question. The church told us to turn the other cheek, that God was coming back, and that with Jesus, our lives would be happy. And the church told us we couldn't wear any Native symbols. They were seen as heathen. Working with Diane Benson on the 2006 and 2008 U.S. House campaigns, I was able to meet many Alaska Natives who shared similar experiences to Diane's with me. Listening to these stories, I was reminded of Kirk Dombrowski's highly-rated book, Against Culture: Development, Politics, and Religion in Indian Alaska. 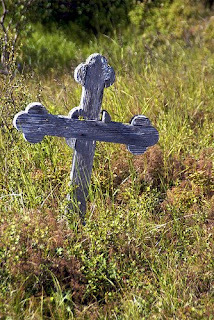 In his book, Dombrowski relates the cultural genocide aspects of evangelical, fundamentalist and - especially - charismatic Christian sects, in their effort to "save" Alaska Natives through conversion so stringent it negated the thousands of years of culture represented in Alaska tribal spiritual practices. From totem pole burnings in the late 19th century to regalia burning bonfires in Southeast Alaska in the early 1990s, to now, millennial Christianity has sought to destroy the power of Alaska Native spiritualism. "To understand Pentecostal church membership in Southeast Alaska today, one must examine it as part of the broader interrelation within and between village communities and their surroundings. "These communities find something dysfunctional in their own traditional beliefs that prompts them to turn from Native spiritualism to this new form of religion: Pentecostalism. 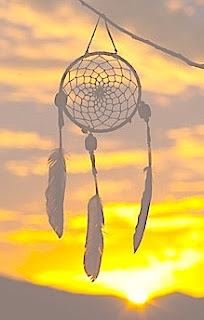 Pentecostalism, in fact, challenges Native beliefs and asks members or those who want to join to question the function of native religious objects. This aspect of Pentecostalism forces members to chose one or the other between new and old. This choice ultimately changes the society members will be affected by. "With the strong clash between traditionalism and Pentecostalism members are choosing a new social atmosphere as much as they are choosing a new religious following. "In contrast to the popular assumption that issues of conscience are entirely personal, belief and cosmology are always social entities. They always involve acting with, upon, or against others." Graham started his interest in Alaska before Sarah Palin became governor. During the first two years of her governorship, she kept a low profile regarding her beliefs. I'm a longtime observer of her fundamentalism. Just weeks before she was elected, I called her during a radio appearance on KFQD's Dan Fagan program, asking her if her beliefs in creationism had "evolved" since our last discussion (she stated on the radio program that "both side should be taught"), and whether or not Anchorage Rev. Jerry Prevo would be given open access to her office. To the latter question, she replied that Prevo would be given the same access as any other member of the clergy. Some of us have been watching her appointments to various boards and commissions, and to cabinet-level positions. The conventional wisdom is that she has leaned too heavily upon an old girl and boy network from Wasilla High School and the Mat-Su Valley. This is certainly true. But closer scrutiny of these appointments should be given to her appointees' relationship to Christian sects that believe the end times are coming, or are very near. On June 30, 2008, David Brody of CBS News reported John McCain met in North Carolina with Rev. Franklin Graham, son of Billy Graham, director of the multimillion- dollar Samaritan's Place [sic] faith-based charitable organization. McCain was courting the religious right who, at the time, were skeptical of his social conservatism and his Christian qualifications. After the meeting Graham issued a statement praising McCain's "personal faith" and added, "We had an opportunity to pray ... for God's will to be done in this upcoming election." Subsequent events suggest that the price of support for McCain by the fundamentalist Christian leadership would be a vice presidential candidate of their liking. Gov. Palin was a logical choice for Franklin Graham, whose ties to Alaska include a palatial, by Bush Alaska standards, second home in Port Alsworth: a community that has often served as a retreat for Christian fundamentalist leaders. Through Samaritan's Place [sic], Franklin Graham has been the chief benefactor of the Tanailan Bible Camp building and rebuilding a church and meeting hall and guest cabins. The evangelical scion of Alaska, Rev. Jerry Prevo of the Anchorage Baptist Temple, is on Samaritan Purse's Board of Directors. Since losing the 2008 election, Palin has been forced to the right, as she seeks to find ways to bring in what will have to average almost $70,000.00 per day between now and 2010, to keep herself in top contention for the 2012 presidential slot on the GOP ticket. The reason she was put on the GOP 2008 ticket, was that she brought the most fundamentalists, evangelicals and charismatics to McCain's plate. Any expansion for her to a wider base will not happen until after she wins the 2012 primaries. Consequently, she appears to finally be showing her hand as an overt Christianizer. I've issued challenges to the Alaska mainstream media and to my co-bloggers before. This is the most serious one yet. I'm convinced that her board, commission and cabinet appointments are going to be more and more connected to Christianist movements than they even now are. I challenge you to prove my thesis right or wrong. I don't believe in religious tests as qualifiers, or as disqualifiers. If the education commissioner is somewhat of a religious whackjob, I'm mostly concerned that he is also a qualified commissioner of education. If a nominee for commissioner of public safety is a religious whackjob, and excellent police administrator and a sexual harasser, it is only the third issue that would disqualify him in my mind. Palin, with evangelist Franklin Graham at her side, arrived Feb. 20 with planeloads of food for rural Alaskans beset by a cold winter, sickening fuel costs, poor commercial fishing and staggering unemployment. The governor’s arrival scene was repeated later the same day in another Western Alaska village. The entourage’s short visit to each village mixed a campaign-trail energy with brief elements of a church-rally. Palin worked the adoring crowds, squeezing cheeks, bending low to pose with elders and kids and bear-hugged strangers as if they were old friends. Nearly every resident in both Russian Mission and Marshall — each village has about 350 residents — squeezed into the community gyms where the food was distributed. During the first stop in Russian Mission, Graham stood to speak. The president of Samaritan’s Purse, his Christian charity used four of its planes to airlift the 75 boxes of food into Russian Mission — one box for each family. Another 99 were delivered to Marshall. The boxes weighed 44 pounds and contained 15 items. One week before the food drop, on Valentine’s Day, Franklin Graham called Lt. Gov. Sean Parnell and asked if there was anything Samaritan’s Purse could do to help the region, he said. Parnell, who joined Palin on the trip, got back to him a couple of days later. “(The state) kind of pulled out all the stops to do this,” Graham said. Then Palin handed out cookies — stuffed with chocolate chips — to a long line of children. Essentially, Governor Palin, who already has proven she cannot distinguish between what is good for her family and what is good for Alaskans (she is asking for some help now, though); cannot distinguish between prayer meetings, town meetings, state aid, and religious evangelism. I received a call from Samaritan’s Purse on Monday, and answered their questions, plus gave them additional contact information from the phone book for villages he didn’t know how to reach. They said that they would be sending 35 boxes of food here to Nunam Iqua, one for every needy family. When I called back on Wednesday, to get more information and check on the status of their delivery they appeared to be quite busy. I was told that they would call me back and answer my questions and give me a date to expect delivery but so far I haven’t heard anything. Essentially, the new Rural Affairs Coordinator is being used as an adjunct for a missionary outfit that is seeking, in the long-run, to destroy the indigenous spiritual beliefs of the people it purports to help. This is known as cultural genocide. The fact that the owner of the group, Franklin Graham, has been implicated in strange aspects of the ongoing genocides in Africa, should give people pause. Alaska's Progressive bloggers will be covering the upcoming North Pacific Fisheries Council's bycatch public hearings in Anchorage. 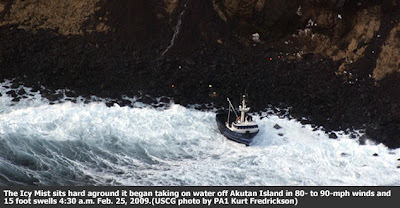 The hearings will center on Bering Sea trawler bycatch. They will be held March 30th through April 6th at the Anchorage Hilton. I'm going to attempt to get accredited. Dennis Zaki, Stephen Taufen and other fisheries reporters will be there, covering the intense interest in the Alaska Native side of this issue. Wesley Loy from the Anchorage Daily News will probably be covering it, too. His reports tend to be corporate-friendly, but honest. Some of the progressive Alaska bloggers are trying to get some qualified Outside reporters in on the meetings, too, as these will be some of the most important, high-profile NOAA-controlled public meetings in the country, since the regime change at NOAA. Mr. Nick Tucker struck the nerve of the situation in an article that appeared in the Anchorage Daily News on January 15, 2009 when he said, "Local commercial fishermen didn’t make any money from king salmon – a staple of the economy..."
Following the Tucker letter, a barrage of news articles and reports appeared in the L.A. Times, Seattle Times, New York Times, and CNN confirming the reasons why people were not able to meet their energy and food needs for the winter, and the lack of commercial fishing opportunity among other things. Absent in the articles and reports is the question, why is our Chinook salmon runs failing? The Yukon River Chinook salmon stocks have never really recovered since the crash of 1998. Regulators of the fishery, both the Alaska Department of Fish & Game and the Office of Subsistence Management instituted severe commercial and subsistence fishing restrictions on our small group of in-state commercial and subsistence fishermen throughout the entire Yukon River drainage depriving our fishermen with the means of supporting and feeding their families. Meanwhile, the Bering Sea Pollock trawl fishery continues to ravage our resources in a wasteful and destructive manner. There's a great clash occurring in the North Pacific over Chinook salmon intercepts by trawl vessels. 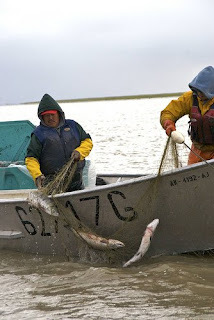 It pits the subsistence needs of native peoples in the river systems of Arctic and Western Alaska - the Yukon , Norton Sound, Kuskokwim and Bristol Bay regions, as well as Canada - against the commercial, industrial fisheries. At the next regional federal fishery council meeting in Anchorage , starting March 30, there will be four days set aside to deal with the conflict and issues. Some would say it's really about a more basic issue - the survival of the Chinook. They ask, "At this point, can the Yukon River Chinook salmon run ever be recovered?" Well, there's likely still time - but only if strong action takes place. 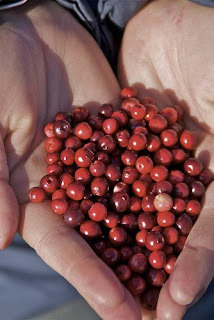 Already in 2009, bycatch numbers are climbing, according to reports from crew members out West, for salmon and halibut. Part Four: How Serious is all this? To me, absolutely serious. Between the Seattle-based trawlers, and their pumped-up boats and money-stoked lifestyles, pitted against the poor people they've been robbing for decades; and the Franklin Graham-tied Palin administration whose beliefs hark back to James Watt's, this is one of the most serious, yet fascinating stories I've been allowed to closely witness. Thanks to Steve, at What Do I Know? for his kind words on Progressive Alaska's coverage of these issues so far. I appreciate your help. But that's barely enough. We want to get restored back to who we are. 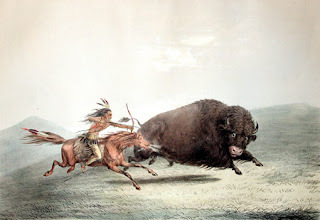 The Native people are very strong people, and this is probably the only time that they cried out for help. It takes a lot of guts to file an ethics complaint against a powerful person, whose unethical, perhaps criminal, actions you can't abide. Some people in Alaska have complained several times about such conduct by public officials. And others have built their political careers around creating a perception that they had the guts to confront the powerful. Alaska's 2007 Muckraker of the Year Ray Metcalfe is in the first category - a person who keeps on coming back, knowing that our state laws and guidelines on ethics for elected officials and state employees are often poorly written, vague or meaningless. His fights to get the truth out about behind-the-scenes deals involving people all across the political spectrum go back into the 1980s. Alaska Governor Sarah Palin is in the second category. If one might distill the muckraker story she has tried to sell into a single sentence, it might read, "I fought the good ol' boys and their crooked deals, whether it was in Wasilla, Frank Murkowski's office, or the Alaska Republican Party." Her battles in 2003 and 2004 against Alaska Oil and Gas Conservation Commission member Randy Ruedrich, and her involvement in the complaints that led - in part - to Ruedrich's resignation from that board, have long been held by Palin and her supporters to be the central pillar of her title claim as an "Ethics Reformer." The fact that Ruedrich was then also Chairman of the Alaska Republican Party, and a possibly powerful blocker, should she choose to move upward, is the central pillar of her claim to be a "Maverick." In 2004, Richard Mauer, Alaska's finest investigative reporter, published a long article about Palin's role in Ruedrich's exit from the Commission. In light of this week's announcement by the Governor's office that she has reached an agreement to return almost $10,000.00 to the state for illegal travel charges she made since her term as governor, it is probably time to compare her statements regarding the 2003-2004 complaint period to what she is stating now, regarding the travel expense repayment agreement. In Mauer's article, written after the Ruedrich affair was past, he writes of Palin's serious concerns about Ruedrich combining AOAGCC business with dates that coincided with Republican Party meetings or activities. She complained that he emailed from a computer in his AOAGCC office. She searched it herself, while he was out of the office. Long before she found those e-mails on Ruedrich's computer, Palin came to fear that she and the commission would lose all credibility in the Valley. She attended many of the same meetings as Ruedrich, she said, and tried to be neutral. She said she was upset by his promotion of the industry. But the final blow came when the commissioners were in a meeting in Anchorage in October, and she asked Seamount, who had firsthand experience with coal bed methane as a geologist in the Rocky Mountain states, to represent the commission on an Anchorage radio call-in program. A few minutes later, Seamount charged into her office. "No, no, no, no, this isn't right. He should not be doing this," Seamount told her. "And I was telling Dan, 'I thought you called in, I thought you were talking.' And he said, 'No, Randy heard you asking me to call in so he went over to his office and he just called in, and he's on the radio right now.' So I turned it on, and went, 'Oh, no.'" Palin asserted several times in the 2004 Mauer article, that Ruedrich's combinations of possible personal, business and party activities with his duties as a state employee were wrong. Because Ruedrich didn't supervise a lot of people, possible misuse of the time of those serving under him never came up. In the complaint Palin and then-State Representative Eric Croft made against then-Attorney General Greg Renkes, Palin was quoted numerous times as believing the complaint process against Renkes, including all documents relevant to the case, should be made public. Even after the case was closed, and Renkes disgraced, Palin stated, "It's important to get these documents made public so Alaskans can make their own judgments." It is troubling that this complaint was such an obvious political weapon, with an associate of a political adversary filing this and making it public – against state law – just before the election. Beyond objecting to the obvious gamesmanship that serves the public so terribly, I think it is important to prevent the ethics act from being used as a tool to ensure that only the wealthy can seek higher office in Alaska. Many have written about the ironies of Palin touting herself as an ethics reformer, while at the same time performing, herself, in extremely unethical modalities, sometimes on several levels simultaneously. Frank Gwartney, who filed the complaint, has now been slimed by his Govenor. He merely read an accurate article, immediately realized that what Palin had done was 100% wrong, found out how to complain, did that, and let people know the truth. All he gets from this so-called ethics reform maverick is an accusation that he has violated state law. For me, this is one of the most despicable things Sarah Palin has yet done. At least that we know about. The Anchorage Daily News and other print/electronic outlets had Icy Mist grounding and rescue attempt photos, videos and reports up late yesterday. But Dennis Zaki at the Alaska Report has taken the trouble to prepare some high quality content of these amazing photographs and a Youtube of the USCG video. Hopefully there will be more visual material coming out from the rescue units. I've been in on dangerous rescues, and have worked in weather conditions like these people went through. A long time ago. Winds of 80 knots with gusts to 120 - things can go so wrong, so totally, so fast, when it is like that. Thank God people are safe. Rural development – Budget provides $20 billion in loans for rural development, plus $1.3 billion to expand and develop rural broadband services. Fisheries management – Improves sustainable management of marine fisheries and ocean resources with support for full implementation of the Magnuson-Stevens Act, the law that manages the $4 billion-dollar seafood industry in Alaska’s marine waters. Climate research - Funding is provided to advance climate and ocean research, including efforts to understand and monitor ocean acidification, and will improve prediction and monitoring of the planet’s weather and climate. NOAA facilities - The budget builds on the recently enacted Recovery Act which provides $600 million for the construction and maintenance of NOAA research facilities, vessels, and satellites, as well as $230 million for habitat restoration, hydrographic services, research, and management operations. Broadband expansion - Invests in America’s economic competitiveness by promoting innovation in U.S. manufacturing, deploying broadband, and advancing measurement science, standards, and technology. Business incubators - Expands economic development through the promotion of regional innovation clusters and the creation of a national network of public-private business incubators. Export opportunities - Promotes opportunities for U.S. exporters in new markets and eliminates barriers to U.S. sales abroad. Accurate census - The budget ensures the resources needed to complete the 2010 census. The decennial census is the Nation’s largest peacetime mobilization and will employ approximately half of a million temporary workers, as well as activities to encourage participation by hard-to-reach populations and ensure completion of an accurate count. Pay raise for troops – Budget includes a 2.9 percent pay increase for service members. Increased Pay for Disabled Retirees – Budget contains proposal to expand concurrent receipt of military retired pay and Veterans Disability Compensation to all retirees receiving disability retired pay. Support for Wounded Warriors – Budget funds a dedicated Wounded Warrior complex in Alaska. Increased Mental Health Support – Department of Defense will fully implement a comprehensive Traumatic Brain Injury (TBI) registry and expand the number of mental health professionals. Early Childhood Education - Decades of rigorous research demonstrates that high-quality early childhood education programs help children succeed in school and throughout their lives. Building on strong investments in the recovery Act, the President’s budget also includes new initiatives aimed at ensuring that early childhood programs yield strong results for children. Successful Models for Low-Achieving Schools. Budget builds on the Recovery Act’s focus on strategic investments in scaling up educational practices that show results and cultivating promising new practices. Health Professions Workforce - Budget invests $330 million to address the shortage of health care providers, expands loan repayment programs for physicians, nurses, and dentists who agree to practice in medically underserved areas. Energy Assistance to low-income families - Budget provides $3.2 billion for Low-Income Home Energy Assistance Program (LIHEAP) to help low-income families with their home heating and cooling expenses. That is the highest level of LIHEAP funding for any year except for the most recent, when the Nation was threatened with an unprecedented increase in energy costs. Health Care for American Indians and Alaska Natives - Strengthens the Indian health system with sustained investments in health care services for American Indians and Alaska Natives to address persistent health disparities and foster healthy Indian communities. Budget includes over $4 billion for the Indian Health Service (IHS) to support and expand the provision of health care services and public health programs. Prevents Teen Pregnancy - Budget supports State, community-based, and faith-based efforts to reduce teen pregnancy using evidence based models. Public housing – Budget provides $3 billion nationally with $3.3 million to Alaska to develop, finance, and modernize public housing in their communities. Native American Housing Block Grant – Budget provides $255 million nationally with $39.9 million to 237 native villages and tribal organizations in Alaska. Tribal entities will use funding for energy efficient modernization of and renovation of housing maintained by Native American housing programs. Assisted housing improvements - These investments will support a broad range of housing and community development projects that are ready to go. Many of these projects have been held up for lack of private investment due to fallout from the broader economic crisis and credit crunch. Tax Credit Assistance Program – Budget provides $2.25 billion nationally and $5.5 million to Alaska to kick-start the production of stalled affordable rental housing projects that rely on Low-Income Housing Tax Credits. Rental Assistance – Budget provides $2 billion nationally with $2.3 million to eight contracts in Alaska for Section 8 project-based housing contracts, to enable owners to undertake much-needed project improvements to maintain the quality of this critical affordable housing. Homelessness - Investments will help communities and families that have experienced the brunt of the economic downturn. Resources will be used to stabilize and revive local neighborhoods and housing markets with heavy concentrations of foreclosed properties. Funds will also assist the vulnerable families and individuals who are on the brink of homelessness or have recently become homeless. Community Development Block Grants – Budget provides $1 billion nationally and $1.2 million to three grantees in Alaska, the Municipality of Anchorage, City of Fairbanks and State of Alaska. Most local governments use this investment to rehabilitate affordable housing and improve key public facilities – helping to stabilize communities and create jobs locally. Emergency Shelter Grant Program/Homelessness Prevention – Budget provides $1.5 billion nationally, with $1.9 million to the Municipality of Anchorage and State of Alaska to help rapidly re-house homeless persons and families who enter shelters. Native law enforcement, education - Strengthens Native American communities through an increase of over $100 million for enhanced law enforcement and education. Wildfire management - Anticipates future costs for catastrophic wildfires with a new contingent funding reserve of $75 million for the Department of the Interior. Renewable energy - Invests over $50 million to promote renewable energy projects on federal lands and waters. Environmental education - Creates educational and job opportunities for young people through expanded environmental education activities and new programs totaling $50 million to encourage them to hunt and fish responsibly. Energy development - Encourages responsible development of oil and gas resources and closes loopholes that have given oil companies excessive royalty relief for offshore leases. Interior will take steps to ensure that oil and gas companies diligently develop their oil and gas leases or risk losing them (“use or lose”). Parks facilities - Protects national parks with $100 million in additional funds to operate and maintain park facilities and resources and $25 million to leverage private donations for park projects. Endangered species - Conserves Federal and State lands and protects endangered species with appropriations of about $420 million from the Land and Water Conservation Fund, with annual increases to reach full funding of $900 million by 2014. Climate change impacts - Assists State and Federal land management agencies with over $130 million in additional funding to monitor, adaptively manage and assess the impacts of climate change on the Nation’s lands, fish and wildlife. Community-oriented policing – Budget begins funding Community Oriented Policing (COPS) which will put more police officers on the beat in Alaska. COPS grants will go to tribal, state and local law enforcement to hire and train community policing professionals, deploy crime-fighting technologies, and develop and test innovative policing strategies. Labor standards – Budget restores labor standards after eight years of erosion, which is important to Alaska because of the high number of work place accidents. Next Generation Air Transportation System – With $800 million, the budget supports this NextGen system to modernize air traffic control. This will transition our air traffic control system from ground-based radar to more accurate satellite tracking system, increasing efficiency and improving aviation safety. Rural aviation – Budget provides $55 million increase funding to improve rural access to aviation systems. Many smaller communities and rural areas in Alaska benefit from this program which subsidizes regular commercial air service connecting these areas to larger hubs in Alaska. Public transportation – Budget increases funding for public transportation to support commuters, improve air quality, and reduce greenhouse gases. This funding could potentially be tapped for the recently-created Regional Transit Authority (RTA) connecting Anchorage and Mat-Su via light rail, and reducing traffic and congestion on the Glenn Highway. Increase funding – VA will receive an additional $25 billion over 5 years. Support for Rural Veterans – Will enhance outreach and services related to mental health care and cognitive injuries with a focus on access for Veterans in rural areas; and will increase the number of Vet Centers and mobile health clinics to expand access to mental health screening and treatment in rural areas. Shannyn Moore alerted me to the growing Alaska awareness of the Bobby Jindal is Ken the Page Group at facebook. I was too busy today to spend much time on that, but Jon Stewart nailed Jindal's similarity to the utter simplicity of Mr. Rodgers, on the Daily Show. Hopefully, the Immoral Minority will cover Stewart tomorrow. In yesterday evening's GOP response to what may have been the most impressive first major speech by a president I've had the pleasure to witness, Louisiana's Governor, uh, blew it. In Alaska, we were perturbed by his suggestion that volcano monitoring is a wasteful activity. We have hundreds of them. 31 are active right now. They sometimes kill people. Although the unpredictable eruptor, Rep. Don Young, Alaska's most volcanic national legislator, wasn't at President Obama's speech, both GOP Sen. Lisa Murkowski and Democratic Party Sen. Mark Begich (a firedoglake Blue America participant), were in the audience. Young's office claims he was "busy," but some suspect he was still down in Puerto Rico, a destination he shares a fondness for with convicted, imprisoned lobbyist, Jack Abramoff. Sen. Murkowski hasn't yet criticized Gov. Jindal. Nor, apparently, has Alaska Gov. Sarah Palin, who somehow was passed over for the job of GOP first responder. Saradise Lost - Book 2 - Chapter 31 -- Sen. Schumer to Palin: "Take It or Leave It!" Progressive Alaska is fascinated with John Ziegler, the maker of the right-wing "documentary" on the 2008 election, starring Sarah Palin, called Media Malpractice. Last year he was on a dating reality TV series. He didn't last long. Great descriptions of the scenes that ended up on the cutting room floor - here. On "Palin Suggests Controversial Solutions for Rural Alaska"
Saturday evening, on my way out of Anchorage, after playing in a concert at UAA, I bumped into friend and Alaska Dispatch editor, Tony Hopfinger. We hadn't seen each other in months, so we had a lot to talk about. Tony, his wife (and Dispatch co-editor) Amanda Coyne, and I, all stopped smoking around the same time over the holidays, so we had a hearty "high five" for each other. Tony asked if I had read "the article" yet. I told him I had not, but hoped to catch the time to do it over the weekend. He remarked that the comments and emails were pretty brutal. 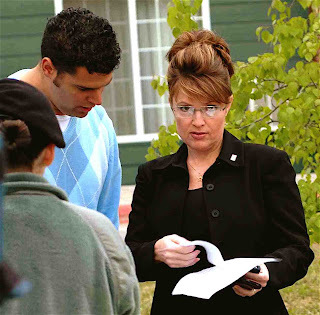 I had scanned Palin Suggests Controversial Solutions for Rural Alaska enough to get the idea that Alaska Governor Sarah Palin had been praised, along with ex-Senator Ted Stevens. I got around to reading the article Sunday evening, then re-read it this morning. Essentially, the article looks at the videos of Gov. Palin, taken before her trip with Franklin Graham, to Marshall and Russian Mission this past weekend (Friday and Saturday), and takes the governor at her word. It then mentions Sen. Ted Stevens' suggestions back around the turn of the 21st century, about consolidating Alaska Native resources into some of the more important communities. Back in 2007, after a lot of in-depth research, Tony wrote To Live and Die in Wales, Alaska, a very thoughtful article for The Walrus Magazine, about a young man's suicide near a village on the Seward Peninsula. (The article was the subject of one of Steve Aufrecht's most stunning essays, at What Do I Know?) Tony knows Bush Alaska better than most. Yet he has the good sense to view himself as an outsider. When Tony and I met on Saturday evening, I commented that if he and Amanda were getting flack for seeming to support Palin (and Stevens), one commenter at Progressive Alaska had asked just that morning, why PA never has ANYTHING positive to say about the Governor. The weakness of Amanda and Tony's article is that it tends to treat Palin's comments last Friday, and Ted Stevens' 2003 remarks as unique, or possibly "controversial" in the sense of being bold or new. They aren't. Alaska survives by taking life, power and value from outside of the towns and cities, and bringing those things to market. Life, in the forms of salmon, King crab, Walleye pollock, halibut or oysters. Power in the forms of crude oil, natural gas, coal and hydroelectricity. Value in the sense of the above resources, and ivory, nickel, copper, gold, silver and other precious metals. In the sense of a long-term, sustainable Alaska, people in Wales, Emmonak, Marshall, Russian Mission and Nunam Iqua, get "it" no less than do people in Anchorage, Fairbanks, Juneau or Seattle. The direct ancestors of Tikagaq people who live in Point Hope have lived there since well before the English, French, Spanish or German languages as we might even vaguely recognize them existed. 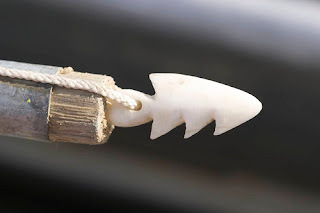 The direct ancestors of the Tlingit have occupied parts of Southeast Alaska for thousands of years, far longer than any written human language now extant has been in use. Native Alaskans survived quite well for thousands of years without non-Native assistance. Tony Hopfinger's The Walrus article about Wales documents the generations of heartbreak White contact have brought that community. There is no lack of other articles and books that do the same. Gov. Palin, during the press conference in Juneau on February 11th, made reference to "Cluster Villages" as a solution to problems in hundreds of isolated, small Alaska Native villages. I think we've seen them already, at least the predominately Native American versions. At best, they are named Gallup, New Mexico. At worst, Rosebud, South Dakota. The concept of moving Alaska Natives from place to place to educate, train or indoctrinate them has been tried year after decade after generation after century. It has seldom worked. Diane Benson has explored various aspects of these attempts and failures in some of her dramatic work. So have other Alaska Native artists. I prefer reading or listening to people like Benson, Desa Jacobson, Heather Kendall-Miller or Writing Raven on these issues, to Hopfinger & Coyne. Certainly Palin is better analyzed by Kendall-Miller on this, than by Hopfinger & Coyne. Coyne should know that, having written one of the best profiles of Kendall-Miller there is. There was far more pre-journey coverage of the Palin-Graham-Provo missionary trip than there has been post-journey coverage. That may change, as impressions from people who witnessed their efforts are just coming in and being published here and there. The reality of people from faith backgrounds like Graham, Prevo and Palin, though, is that unlike early Christianity, during its expansion into non-Christian areas, the Graham-Prevo-Palin version of that religion has no intention whatsoever of adapting any aspect of its doctrine to the people it seeks to "help." Rather, it is that faith's expectation for those it seeks to "help" to be converted, through evangelical activities, to their very restrictive world view. 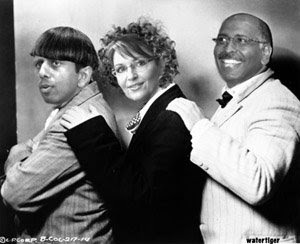 Prevo, Palin and Graham all represent a narrow subset from within Christian doctrine, that expects the world to end soon in a cataclysmic event. Some Alaska Natives all over the state have already been exposed to these peoples' brand of Christianity. 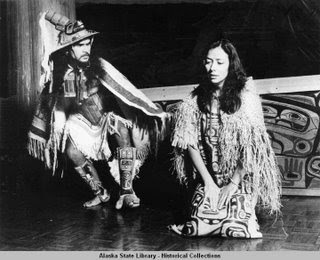 It is expansionist, and regards the growth aspect of its existence to be far more important than assisting any single aspect of any Alaska Native culture to survive in a meaningful way, let alone the package represented by the spiritual independence of Alaska Native cultural renaissances here and there . 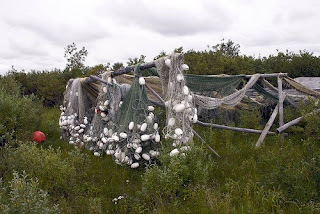 Regarding creating "Cluster Villages," one needs look no further in Alaska than the coastal fisheries management practices as created with the extensive help of Sen. Ted Stevens, or to the buildings occupied - but not owned - by Native Corporations, to see how well Palin's, Hopfinger's, Coyne's, Graham's and Prevo's visions might work. Outsiders from Seattle would own the means of production, distributing crumbs, called "IFQ's" until they chose to stop distributing them. 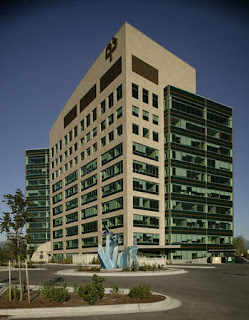 And the "Cluster Village" headquarters and administrative offices would be owned by a Jon Rubini-esque developer, who would rent or lease these facilities out to the Alaska Natives at a higher rate than they would have had to pay to end up owning them over the course of a generation. How do you tell people who have been around a few generations, that their ideas on how to manage the affairs of people who they have all but ruined, but have been here for millennia, haven't been proven? erin and hig are proud parents. Here's a photo of their brand-new son, their Valentines Day gift. A few highlights from his birth… I managed to shock/impress/flabbergast the whole nursing staff by walking up the hill from the hotel to the hospital while in labor–arriving at about 8 cm dilated. We also walked back the day after he was born. Only this time his dad got to carry him. Finally! 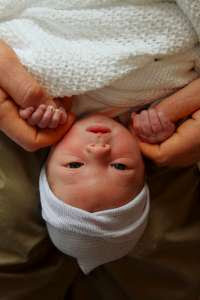 It was a beautiful natural birth in the Homer hospital with a great midwife (Julie), nurse (Jean), and of course Hig. The first stage was easy, but the second one wasn’t! It was a good thing that I spent the whole of this little guy’s incubation time walking and hiking–I needed all that endurance for the more than three hours it took to push him out. Katrina Vanden Heuvel, Editor of The Nation, in this ABC This Week clip (from March, 2006), quotes the British Commissioner for Pollution, as stating, "Those who deny global climate change [are] 'climate loonies.'" It is an exchange with Washington Post columnist, George Will, a long-time climate change skeptic loony. Will's February 15th, 2009 WaPo column, Dark Green Doomsayers, claims that scientists widely believed the earth's climate was cooling, during the 1970s. He uses that erroneous claim to once again launch into a foray against reason. Complaints to the WaPo ombudsman, and the ombudsman's pathetic reply, have been the subject of many blog posts through the late week and weekend. Back to so-called "climate change skeptics." They sometimes rant about how dangerous those who are concerned about global warming are. Dangerous to the economy, dangerous to personal freedom, dangerous to religious ideas, and so on. Scientists and public policy figures concerned about the dangers of global warming, and industrial practices which exacerbate that change, sometimes do sound more militant about forcing change than is likely to make the general public comfortable. But that doesn't change the fact that in most cases they are right - drastic public policy changes are needed very, very soon. Locally, in Alaska, the organization that has put the most energy into criticizing the validity of climate change research has been Exxon-Mobil. Interestingly, British Petroleum has come down on the other side of the argument quite often. Alaska Gov. 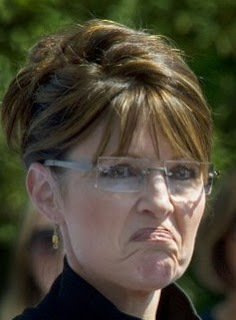 Sarah Palin has been all over the place on this issue. She appeared to come around to admitting human influence upon conditions creating global warming during the 2008 presidential campaign. In 2007 her administration created a sub-cabinet to deal with climate change issues, but it has done very little. Of far more impact have been anti-science stances by her administration, most notably those involving Polar bear research information access. The Alaska media appears to be, by and large, accepting of the vast majority of scientists, and of their concern about the impact of climate change upon Alaska. The exceptions come mostly from marginal outlets, such as right-wing talk personalities. Some of these people are given more of a pulpit from which to launch damaging attacks than are others. The climate change skeptic who has gotten the most air time, column inches, and now his own web presence, is Anchorage talk show host, Dan Fagan. His new on-line blog, The Alaska Standard, has brought some of the weirder writers from the Mat-Su Valley News on board, to write about their views on the subject. On and off, since the early 1990s, I've asked myself, "Will it get to the point where people who try to stop action mitigating global warming are actually responsible for increased mortality on a wide, trackable scale?" By early in this century, I was adding the corollary, "Should environmental catastrophes created during war be considered 'war crimes'?" Saddam Hussein's intentional torching of the Kuwaiti oil fields in 1991 was a great example. The 2006 intentional bombing of the Jiyah Power Station's fuel storage tanks by the Israeli Air Force was another. Our uses of depleted uranium munitions in Kosovo, Serbia, Afghanistan and Iraq are yet another. By the time we could bring a positive change to the Yukon - say 20 years - questions like that will be meaningless as we witness the deaths of so many ecosystems worldwide, the deaths of hundreds of millions, perhaps billions of people, because of other aspects of climate change and related economic disaster. Part One: Progressive Alaska started a Saturday feature last March 29th, called "Saturday Alaska Progressive Blog Roundup." So much has happened since then. Every once in a while, I've tried to bring it back, because a lot of folks appreciated the roundup. I'll give it another try. We've grown a lot since March, 2008. There are more progressive blogs in Alaska now. During the first eight months of 2008, our collective readership was slowly growing, as Alaskans and people around the USA and the world sought information on Alaska politics. We were enthusiastic. Along with other progressive outlets, spurred locally by the articulate and dynamic trio of talk hosts at KUDO-AM in Anchorage, local bloggers engaged heavily in the Municipal election there. Progressive Alaska bloggers covered both the Alaska GOP and Democratic Party conventions. We reported on candidate forums and debates all through the winter, spring and early summer of 2008, leading up to the August 26th statewide primaries. On August 29th, 2008, the McCain presidential campaign announced Sarah Palin's selection as his choice for running mate. It has been a wild ride ever since. 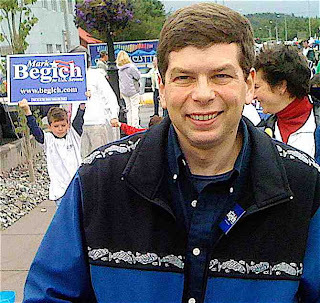 Without fanfare, without a pair of evangelical celebrity preachers flanking him, Senator Mark Begich traveled to Bethel and video conferenced with several other villages, including the village of Emmonak. Well according to Governor Sarah all the rural native Alaskans have to do to solve their difficulties is to leave their ancestral homes and run to the big cities just like her husband Todd, who according to Palin worked on the Slope and then "come back to the village after a, one and one, or a two and two, week schedule and still lived a subsistence lifestyle." Now you know I just hate to disagree with the Governor but when I heard her make this statement I remembered something I had read in that future bestseller "Trailblazer: An Intimate Biography of Sarah Palin." In chapter four page 56, of this riveting manuscript I read the following:"When they returned to Anchorage, Todd moved in immediately with the Heath sisters (This was right after their marriage on August 29th, 1989) and shared a room with Sarah. 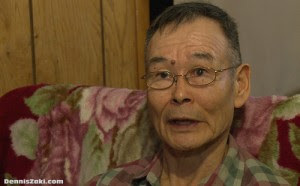 He had applied for an oil-company job on the North Slope and was waiting for an offer. In the meantime, he drove snow-removal trucks in Anchorage, usually working the red eye shift." So let me see if I understand this correctly. Todd Palin was living a subsistence lifestyle in Wasilla? Really? Were Todd, and Sarah, and little Track subsisting on fish and berries and wild game that they hunted when Todd was not working on the North Slope? Or does Governor Sarah believe that Todd deciding to walk into the woods and shoot a moose, or go to the Knik river and catch some fish, is a direct correlation with how the rural Alaskans in villages like Emmonak live their lives? 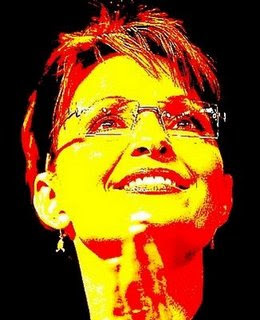 Palin is calling for a change in leadership - with who? What are these leaders doing wrong? Who are they? When has she talked to them? And she gave NO solutions except to say these youth should think about leaving. So the solution is "leave the village"? She can't be a spark to "real dialogue" when she's never taken part in a dialogue! The dialogue has been going on, but Palin doesn't care to be part of it. The article was also preemptively defensive about the race card being thrown at Palin. As if Palin needs to be a racist to make ignorant remarks about the state of rural Alaska. Personally, I believe Palin is willing to be pretty racially equal about throwing rural Alaska under the bus. For that matter, she's screwing us all equally in her painfully obvious stab for national attention. I didn't agree with the remarks about Ted Stevens at the time (don't think the guy was racist, just wrong) and it is interesting to note that the only people to bring up racism with Palin's remarks have been the people of the Alaska Dispatch. To be very clear - Palin's remarks aren't racist. They are ignorant of the real issues, display a willingness to decide what is right having never had the dialogue, and take us back about 50 years in the struggle to maintain thriving rural and cultural communties. But in ignorance, she's being quite equal. Once again, Palin offered no solutions to these problems. She talks about them getting jobs, but not about training, or the availability of them. Does she think every Native youth has a father on the slope and the governor willing to write a letter of recommendation to get them that job? It's really not that easy. It also displays an incredibly poor grasp of the situation. Some of these families are paying $2,500 a month just for their oil. Getting a job on the slope doesn't fix that problem, and it will continue to be a problem. (Lt. Gov. Parnell) "Frankly, the first weekend that this particular regional hardship hit the web from Emmonak, both the governor and I tried to get our there and we were hampered due to weather." In May, the Bristol Bay Times reported on rural residents calling for emergency relief and to declare an energy diaster. In early August, the Anchorage Daily News reported prominent Native leaders directly talking to Paling about these problems, and the solutions that including building infrasctructure. In early August, even USA Today noticed the problem and reported on it, referencing data showing just how bad it could get from a study done in May. In late August, Sen. Murkowksi held a meeting about the crisis, and urged residents to stay in their communities (report by ADN). In September, Sen. Begich (then Mayor) and Anchorage School Superintendent sent a letter to Palin (from ADN) regarding the migration from villages to the city due to high energy costs. Palin refuted high energy costs had anything to do with it, later. In October, Native leaders continued their call for an energy emergency declared at the Alaska Federation of Natives convention (reported by the ADN). Of course, Palin was busy campaigning and may not have noticed. In November, Indian Country Today did a story highlighting the Alaska Federation of Natives resolution to the energy crisis and village migration, as well as the incredibly poor response from Palin. In late December, Indian Country Today reported on the dismal reaction of the Palin administration energy crisis, focusing on the rural subcabinet formed. "The Rural Subcabinet formed by Governor Sarah Palin in response to what many consider a crisis in rural Alaska has reportedly met, but specific information about their activities has been difficult to find..." "The group has no fixed meeting time and the date of their next meeting is unknown." "...As of Dec. 8, the AFN had apparently heard nothing about actions or meetings of the subcabinet..."
Of course, this is only in recent months. This stuff goes back years, as far as addressing the real problems. Not to mention the other villages that have had true emergencies, including Adak. Once again, I point to the Alaska Native Commission Report done in the 90's that point out both problem and solution. Palin should think about reading it. Part Three: Heather Kendall-Miller. That leads me to commenting about lack of coverage by Alaska progressive blogs of an important event this past week. Athabaskan activist attorney Heather Kendall-Miller is being vetted for an important post in the Obama administration, that of Native American Affairs senior advisor. Kendall-Miller wrote a scathing review of Palin's record as governor in regard to Alaska Natives, last September. Amanda Coyne wrote a thorough profile of Kendall-Miller in 2007, which the Alaska Dispatch reprinted this week. Part Four: The Fairclough-Hamilton Dialogue. [T]here have been questions raised recently about sanctions against respected university researchers who have produced reports critical of sacred cows. Biologist Rick Steiner criticized a Sea Grant initiative on offshore oil development; emeritus professor Steve Aufrecht is investigating the terms of the BP-ARCO charter agreement with the university. His [Hamilton's] response is most welcome, for there have been questions raised recently about sanctions against respected university researchers who have produced reports critical of sacred cows. Biologist Rick Steiner criticized a Sea Grant initiative on offshore oil development; emeritus professor Steve Aufrecht is investigating the terms of the BP-ARCO charter agreement with the university. So, how did Dr. Haycox come to these conclusions? My guess is that "there have been questions raised" refers to Philip Munger's post on his blog Progressive Alaska where he first discusses how Dr. Rick Steiner's signing of an open letter critical of the "North Aleutian Basin Energy-Fisheries Initiative, being implemented by the University of Alaska Fairbanks (UAF) and Alaska Sea Grant" resulted in his Dean chastising him in a three year post-tenure review for abusing his academic freedom. University of Alaska Professor Emeritus Steve Aufrecht has been trying to determine whether or not the so-called "Merger Charter Agreement" that enabled the formation of the entity now known as Conoco-Phillips is legally enforceable, or is a mere scrap of paper. If the agreement is enforceable, it appears quite likely that Conoco-Phillips owes the University of Alaska money. A lot of money. But now Haycox picks up the word investigation and lumps the two profs together to suggest that both face sanctions for their activities, when really only Steiner did according to Munger. Rep. Anna Fairclough gave a brown bag lunch talk at UAA on Thursday. I had hoped to be there and write about it, but couldn't. Steve Amundson did, though. The Alaska Dispatch has printed Amundson's essay, called Did Rep. Fairclough Lie at UAA?